We’ve known of the D850’s existence for almost a month now, and that’s given us plenty of time to work out what Nikon’s been cooking for this latest release. Naturally, leaked press shots and credible spec lists on rumour sites help too, but even without this, we’ve had Nikon’s last few enthusiast and pro-grade models to guide us on what was to come. Features, such as the 153-point AF system and 180k-pixel metering sensor are things which tend to stick around for a while, so their inclusion here is no surprise. The evolution of the LCD screen to a 3.2in, 2.36million-dot panel that tilts and responds to touch – which the D810’s lower-resolution screen did not do – also makes sense. Smaller changes, such as the in-camera Raw batch processing option, seen in the recent D7500, is a nice addition too. The new 45.7MP sensor is impressive on paper, even more so when you consider that the camera against which it’s most likely to be compared, the Canon EOS 5D Mark IV, only has 30MP. It’s worth remembering, however, that for resolution-hungry applications, Canon does also offer the 50MP EOS 5DS and 5DS R.
The large, rubbered grip, together with the position and design of all key controls means that the camera generally feels very positive to hold. It perhaps isn’t as heavy as you’d expect (915g without the battery), despite the fact that magnesium alloy has been used liberally, inside and out. The joystick on the back that can be used to change the AF point - something else we’ve seen recently - moves freely, and makes light work of shifting this point. It’s also good to see that Nikon has finished the new MB-D18 battery grip with the same control, as this really helps here; obviously for portraits this is a huge bonus. The inclusion of an actually silent electronic shutter, rather than a ‘Quiet’ mechanical option, is also something that we ought to be seeing on DSLRs if they’re to keep up with the recent breed of mirrorless cameras. This really impressed us in use, as did the ability to lock the focus for subsequent frames once the first image has been captured in this way, simply by pressing the screen. This might not be too big a deal for those who never use live view, but with a more flexible LCD screen than before, the D850 may sway viewfinder aficionados to occasionally call upon live view, and in turn, this option. It’s certainly welcome to see that Nikon has increased viewfinder magnification to 0.75x from the D810’s 0.71x, but we’re not sure this is something which made much difference in practice. Still, the viewfinder itself is certainly pleasing to use, being bright and showing its various LCD markings clearly. Other features are somewhat unexpected, such as the ability to focus stack 300 images, or the fact that the camera can pump through so much more information than the D810 despite the increase in pixel count. It can shoot 51 Raw frames at 7fps, next to the 26 Raw frames at 6fps that the D810 could manage. Aside from the processing engine, this is possible thanks to the use of XQD media, in addition to SDHC/SDXC cards. Some people will have no doubt wished that Nikon simply stuck with one format and provided two similar slots, but it’s good to have the option of XQD as some applications will demand this on a model of this kind. We had a chance to use the camera with both an XQD card and a regular, everyday SD card and the difference is staggering; a camera of this calibre needs something speedy for it to make sense. Slower cards also appear to affect your ability to zoom into images if they are still being written to the card, so it might be something to consider if you tend to rattle off frames in quick succession, without actually calling on the burst-shooting option. 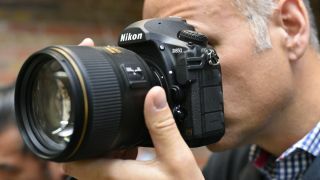 Response in general is also great, although anyone familiar with Nikon’s most recent models should expect this to be so. There’s no obvious delay when changing settings and, when used to navigate the menus, the touchscreen moves through the list of options with a good response; not too fast to frustrate but fast enough to get to where you need to be. The new option to shoot in a 1:1 aspect ratio may strike you as something that should have originated on a more junior model aimed at the Instagram generation, although such a crop also, of course, harks back to the 6x6 medium format frame. You don't even need to use live view for this, as the camera provides shading in the viewfinder to match that aspect ratio. We can see this eventually filtering down the line. Overall, you come away from the D850 feeling that Nikon has not only done a great job to refine a familiar concept, but also to make it more tempting for those who may have been curious to make a switch to mirrorless. As a competitor to the likes of the Canon EOS 5D Mark IV is stacks up very well, particularly given the higher pixel count, crop-less 4K video recording and the very similar price point (at least at the time of writing). It also becomes the latest camera to be able to match a high resolution sensor with a respectable burst rate for action photography. Traditionally we’ve had models that have offered one or the other, and aimed at different markets accordingly. But here, the camera follows other recent models such as the Olympus OM-D E-M1 Mark II and Sony A9 in catering for everyone - and that’s very encouraging to see. We’re very excited to see what it’s capable of once we get a sample in for review.